Get ready for the runway in this trendy little number! 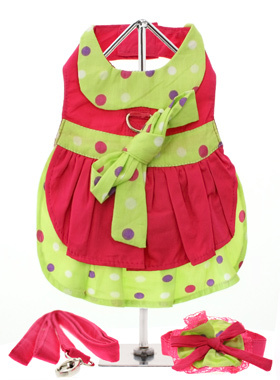 100% cotton, hot pink and bright lime green with polka dots make this dress a real eye catcher. It has a sturdy reinforced D-Ring and a double sized / double strength velcro for comfortable and secure fastening. This harness dress set comes complete with a matching lead and hat (that can also be used as a fashion collar).